Judy Rodgers, chef-owner of San Francisco's Zuni Cafe, makes the best biscotti ever. This is her recipe. Preheat the oven to 325 degrees. Line 2 or 3 baking sheets with parchment paper (or a Silpat mat), or generously butter the baking sheets; set aside. Scatter the almonds over (another) baking sheet and toast until dark-medium brown, usually 12 to 15 minutes. Cool slightly on a wire rack; leave the oven on. Chop enough of the almonds to measure ¼ cup. Set both the chopped and whole almonds aside. Cream the butter with the sugar using an electric mixer just until combined, no longer. Add the eggs and mix until blended. Add the anisette liqueur, anise seeds, 1¼ cups of the flour, the cornmeal, baking powder, salt, and all of the almonds; mix until combined and the nuts are distributed. Stir in enough of the remaining ¼ cup flour so the dough comes together, but is not sticky (the dough should pull away from the the sides of the bowl). Working on the prepared baking sheets, shape the dough into 4 or 5 logs, each about 1 inch wide and ¾ inch high. 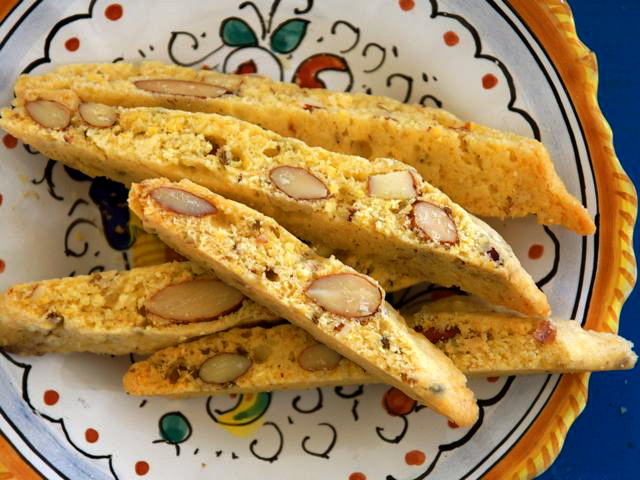 Cut the biscotti into even slices (using a sharp knife on a cutting board) about ½ inch wide. Arrange the slices, cut sides up, on the baking sheets. Return to the oven and bake the biscotti again until very lightly browned, about 10 minutes. If you don't have anisette liqueur you can substitute a combination of 1/2 Tablespoon vanilla extract and 1/2 Tablespoon almond extract. Also, I like to add the zest of 1 lemon to the batter.